SAN FRANCISCO -- San Francisco’s buses, trains and transit shelters will no longer display advertising that includes political messages, CBS San Francisco reports. 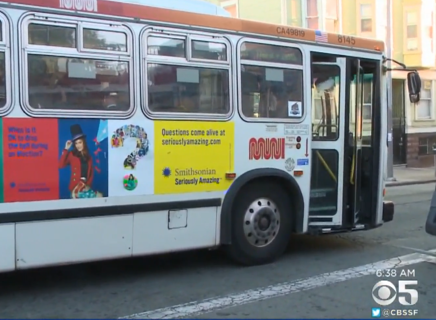 The San Francisco Municipal Transportation Agency board voted unanimously -- and without discussion -- to approve a new advertising policy that prohibits ads concerning public or political issues. Political ads have caused controversy for Muni -- the transportation agency -- in the past. Most notably, a series of anti-Muslim ads posted by the American Freedom Defense Initiative in recent years have been denounced by city officials. “These ads have generated complaints from our customers and our operators and have distracted from our ability to run the transit system,” Muni Finance Manager Gail Stein said Wednesday in a presentation to the board. Muni officials have in the past said they could not turn down political ads based on content, without risking First Amendment lawsuits. The changes adopted, however, are based similar policies adopted successfully by other transit agencies around the country. Stein said advertising provides around $20 million in annual revenue for Muni.